Only a short drive from Cusco, Ollantaytambo is a small town nestled into the Sacred Valley of the Incas. Unsurprisingly, there are many stunning examples of ancient Incan terraced architecture in the town. It’s also a popular starting point for three to four day treks along the famous Inca Trail, ending at the spectacular Machu Picchu. Sitting beside the beautiful Patakancha river, Ollantaytambo once served as a capital for the leader of the country’s resistance against the conquistadors, Mano Inca. We’ve selected the best places to stay in Ollantaytambo to take in both the spectacular scenery and history. Go to visit the incredible Incan ruins at the Archaeological Park Ollantaytambo. Pictures won’t do it justice! Hike or take a horse up to the Pumamarca Ruins. Shaped like a puma’s head, the site is a breath-taking example of traditional architecture. It’s also possible to drive close to the ruins and walk the final stretch. Take the short walk to the Inca Bridge surrounded by steep cliffs and admire the views of the stunning valley. Note that the bridge itself is modern but built on Incan foundations, so don’t panic when crossing! Indulge your sweet tooth with a visit to the Chocomuseo, Ollytaytambo where visitors can learn about the history of cocoa and of course make yourself some chocolate. Stroll around the Mercado Artesanal and find a range of authentic Peruvian products for sale. The best places to stay in Ollantaytambo are very popular during the peak trekking season, so if you plan to visit during these months, get organised and book well ahead. El Abergue is a chic and comfortable hotel situated within the train station where trains take you directly to Machu Picchu and Cusco. With intimate and rustic rooms offering great views over the green surroundings, it’s the perfect starting point for any adventure. There’s also a sauna to unwind in! If you'd prefer your own space, don't hesitate to visit our online partner Booking.com for properties located ideally to enjoy everything this fantastic town has to offer. Fly to Alejandro Velasco Astete International Airport located 75km (46 miles) from Ollantaytambo with a range of domestic and international connections. Catch a train to Ollantaytambo with routes to Cusco and Aguas Calientes. Or the bus which provides various connections including Cusco. Best time to visit - the temperature is generally between ten and fifteen degrees throughout the year and to avoid the rain, aim to visit between April and August. Browse through our pick of the best places to stay in Ollantaytambo. 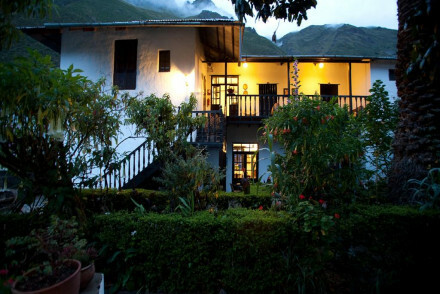 This inn is situated in Ollantaytambo which is 19 miles away from Machu Picchu. It features rooms decorated in a chic, rustic style and has wonderful views of the surrounding area. Relax in the sauna after a long day hiking or book yourself a massage to fully unwind. A peaceful and unique spot.